This workshop will bring together students, researchers, and industry from Neuroscience, Perception, Microsystems Technology, Applied Optics, and Robotics to discuss recent developments in the understanding of compound-eye imaging, the construction of artificial compound eyes, and the application of artificial compound eyes in robotics or ubiquitous computing. It will include a presentation and live demos of the CURVACE prototypes. The workshop will comprise single-track oral sessions as well as a poster session. 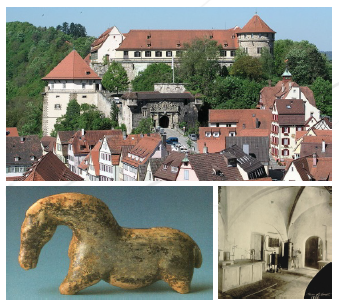 It will take place in the historic castle of Tübingen, Germany. Today, the castle is part of the University. It is renowned for the University Archeological Museum, featuring the Vogelherd Horse, one of the world’s oldest pieces of sculpture (ca. 35,000 BC), as well as for the laboratory where Friedrich Miescher first isolated DNA in 1879. Tübingen is a charming university city located in southwestern Germany; the closest international Airport is Stuttgart (30 km). Accomodation possibilities can be checked here.